In Zagreb, the Croatian capital, the overriding presence—especially in the city’s public spaces—is Croatia’s greatest sculptor Ivan Mestrovic. This world-renowned artist lived in Zagreb only 20 years, but his public art is among the city’s biggest highlights. Ivan Mestrovic (1883-1962) was the spiritus movens of the cultural scene in his time. His themes were often personal and local, but his talent traveled far across borders. Often dubbed the Croatian Rodin, Mestrovic achieved recognition at all major art scenes. From Vienna, Paris, London, and later America. Zagreb without Mestrovic would not be the city it is today. Its major squares and arteries all hide the artist’s signature. 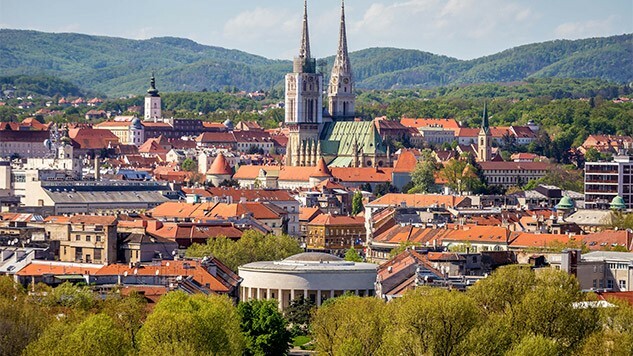 A first-time visitor to Zagreb would only need to follow Mestrovic’s trail to get a snapshot of the city’s cultural identity. Most tourists will easily discover the exceptional Mestrovic Atelier, his home and studio. This 17th century villa showcases more than 100 marble, stone and wooden sculptures. Its remarkable interior, designed by Mestrovic himself, offers an intimate encounter with the artist’s talent. His presence in Zagreb’s public spaces is a bit harder to pin down. Few tourist guides offer such thematic walks—and even fewer brochures map out his sculptures and buildings. To really understand Zagreb, however, you should still look track them down. In doing so, you can curate your own open-air exhibition with the following treasures. This poignant fountain from 1905 brings together the human figure and the abstract shape of a circle. Bronze meets the element of water in the universal theme of life as a constant change. You will find The Well of Life facing the imposing building of the Croatian National Theater. And like the locals, you will remember it as a symbol of Zagreb. It’s hard not to notice the poised mother figure, one of Mestrovic’s leit motifs, at the entrance to the Faculty of Law. She is holding a stone slab with the Glagolitic (an ancient Croatian alphabet) inscription. The sculpted woman allegedly represents Mestrovic’s own mother. But the sculpture is also a national symbol: Every Croatian citizen carries it on the first page of their passport. Built between 1934 to 1938, this round building dominates the east-central part of Zagreb. Today home to the Croatian Association of Artists, it hosts art shows in its three fab exhibition spaces. What’s more fascinating is how this architectural gem communicates with the cityscape. Watch from the outside how the building dictates the layout of the surrounding streets … including the traffic, which flows in a circle. Mestrovic and Tesla lived in the US around the same time. The correspondence they kept prove that Tesla was a great fan of Mestrovic’s work. So much so that he trusted only Mestrovic to do a sculpture of him. And in 1954, the artist delivered on the promise. Tesla’s bronze image stands on the corner of his namesake street, and is one of many Mestrovic sculptures depicting public figures. You can also track down those of the physicist Ruder Boskovic (in front of the Institute Ruder Boskovic) and Josip Juraj Strossmayer, the founder of the Croatian Academy of Sciences and Arts (in front of the Academy building). No doubt, art and architecture are among biggest Zagreb charms. And one of the quickest ways to learn about the city’s magic is by following Mestrovic’s mark on the city. TIP: A grand multimedia exhibition Nikola Tesla: mind from the future is slated to open November 20, 2017, at the Mestrovic’s Pavilion. Andrea Pisac writes offbeat stories about Croatia at Zagreb Honestly and for other travel publications. Follow her on Twitter.